Event Marketing – and marketing strategy in general – has traditionally started at the top of the marketing funnel. Demand generation starts at evaluating and defining the universe of prospects for a marketing campaign or initiative, and building out marcom strategies from there. 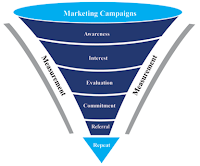 With the advent of Social Media there are, of course, new models being built around inverted funnels – a ‘one-to-many’ approach – that may disrupt the method, but currently the funnel – with some revisions – is still in place. The issue is that the traditional troughs feeding names to the funnel are evaporating. According to statistics published by MediaFinder.com, magazine titles closing outpaced new launches by over 55% in 2009. While this is another obvious testament to the economy and the changing face of communications, it also presents a challenge to the Event Marketing industry – a shrinking of available subscriber names from which to source your target audience. In short, the notion of “available audience” has taken a beating over the past 18 months. Specifically, with unemployment numbers rising and, in the interest of budgetary prudence, investment in internal data cleaning being a bare minimum, ask yourself: what % of your database is still current? Add to that the universe of external lists contracting and event marketers seeking new, qualified sources of names are faced with a burden. Compiled Lists: while considered less than optimal as opposed to controlled circulation or buyers’ lists, these can be beneficial as they typically have a greater range of demographics to select from, enabling a very targeted audience to be produced. Online Lists: with the advent of online registration forms, there are lists available of individuals (with opt-in permission, of course); an added benefit are that these names contain, by nature, individuals who have utilized the Internet to at least register/purchase products or services. “Other” sources: Portner cited a list of subscribers for a title which has long since ceased publication. The subscribers are a finite demographic, however, and the publisher “keeps the file current as best they can,” and had gotten continued positive feedback regarding response. To clarify, this post is not a clarion call to switch to a campaign of external lists sources – instead, it’s recognizing that events marketers have sourced these lists historically, that there are challenges in attaining these lists today, and thoughts on how to address. My overall suggestion has always been to use these names to augment your internal database and your online and demand generation activities. And, of course, to test and measure results on an ongoing basis. The benefits of internal databases vs. external lists vs. social media, etc. in developing event marketing strategies is an argument for another day; in reality results vary from industry to industry and organization to organization. But supplementing your outreach efforts by strategically adding external names to the mix is certainly a tactic worth considering or revisiting as 2010 unfolds. And thinking through the most effective way to source these names in a declining market is key. And please do share thoughts, success/horror stories – would be great to hear them! P.S. I'm also pleased to let everybody know I am very excited to be presenting at the VirtualEdge 2010 Summit next month - check out the details here!